For the repair and service of all rotating and fixed equipment throughout Western Australia. At EMR we’re dedicated to offering our customers service of the highest quality on every occasion. In keeping with this in June 1998 we engaged QA Management service and implemented Quality system AS ISO9001. This has helped position the company as an industry leader in quality repairs and services. EMR prides itself in being able to offer repairs, rewinding and overhauls of a wide variety of electrical equipment. EMR delivers World class repairs utilising the latest equipment sourced direct from the manufacturers following EASA Recommended Practice for the repair of rotating electrical apparatus. Run the payback tool to calculate electricity consumption, running cost and find out the reduction in CO2 emissions of the motor you selected. 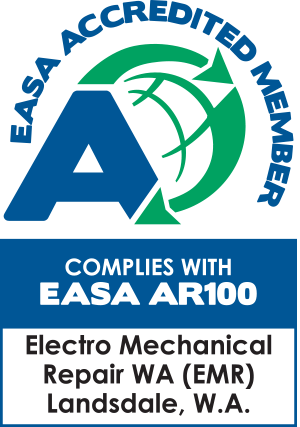 Our EASA Accreditation means that we follow the prescribed good practices to consistently deliver quality electromechanical repairs that maintain or improve AC electric motor efficiency and reliability.